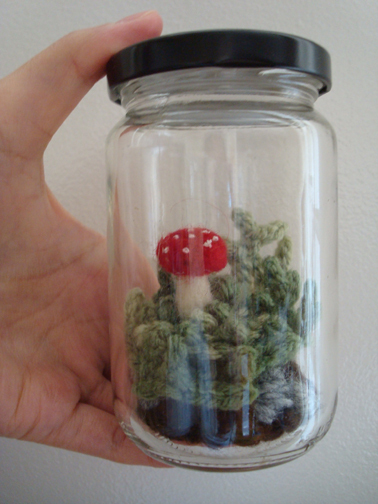 This is the first thing that I’m really excited to write about — a crocheted terrarium with a needle felted mushroom! What I thought was really special about this terrarium is that the idea came from a dream. Seriously! A couple of weeks ago I had a dream in which I was making terrariums with a group of women. I don’t think I know who these women were, but we were crocheting plants and whatnot with white and ivory‐colour thread to put into glass jars. Somehow I learned that they were terrariums, and they were all lined up on a dark wood table. Somehow I also learned about the crochet pattern for the plants from the dream. I guess I crochet so much that I even dream about making up crochet patterns.…? But anyways, in the dream I crocheted a long strip of fabric about 1 inch wide with single crochet stitches, while adding short chains and slip stitches to create leaves and twigs on one of the long sides. When the strip is done it is rolled up, stitched together, and tucked into the jar. So that’s exactly how I made the mossy part of the terrarium. 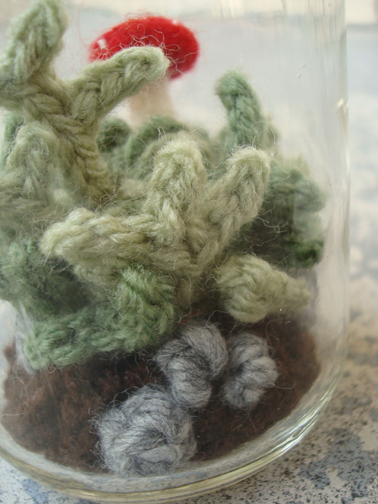 Even though the plants in my dream were white I happen to have this moss colour yarn around so I used that instead. I crocheted a brown circle and stitched it to the bottom of the moss piece. The pebbles were french knots made with grey chunky yarn. 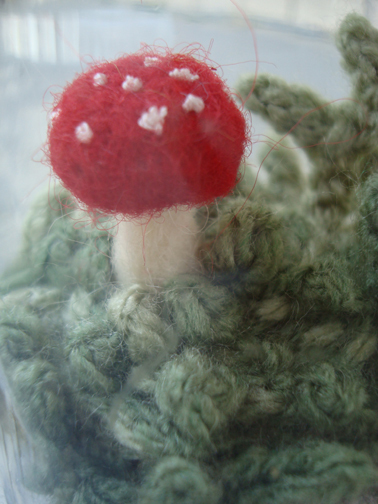 Then I needle‐felted a mushroom. It’s tiny and it’s so cute. 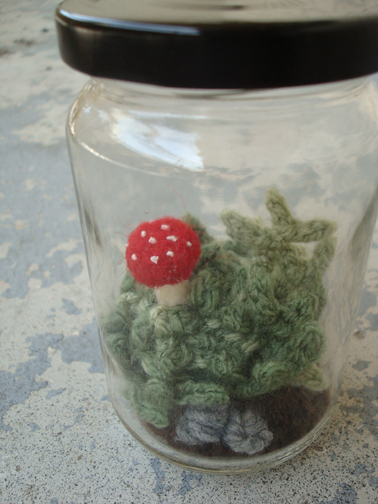 So here we have it, a crocheted terrarium! A self‐sustaining world that holds the magic of that random dream of mine. You have an air of lighthearted fluffiness about you, and also a sense of creativity and originality that cannot easily be reproduced. Keep up the lovely handiwork. I love the dream terrarium and the whole idea of finding what inspires you.